Whether Magento is purposely doing that Breaking Bad 5th season thing, prolonging our anticipation to get us hooked, or not, it’s working a great deal. The release of their second version has been the most awaited e-Commerce occasion for several years now. And, thus, each of us in the online trading community had time to form a personal opinion about the effect the cart will have on the market. 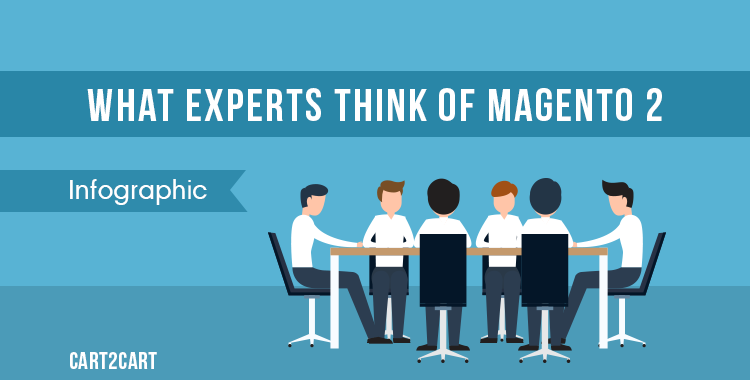 However, if you're not satisfied with just bloggers’ predictions on Magento 2, and want to hear true experts’ opinions - today, you are in luck. Cart2Cart team has collected the most curious opinions about Magento 2, from cart’s developers, trainers and e-Commerce experts and put them into one, blue-colored infographic for you to enjoy. Thus, have a look, and find out what do experts think of Magento 2. If you are excited by Magento new version learn How to upgrade your Magento current vesrion automatedly and effortessly. From our side, we wish Magento 2.0 a market success and promise to add the cart’s support as soon as it’s released.